Michael Darroch is a businessman. 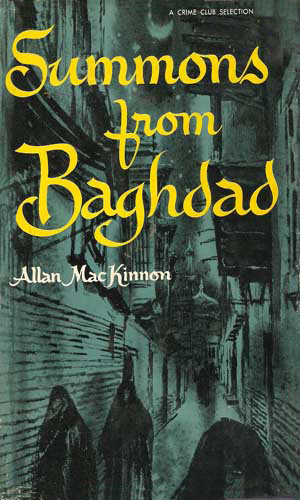 First living in London and then moving to Baghdad at the death of his father. Darroch has no desire for adventure or danger. Unfortunately for him, he has little say in the matter. Though not formally associated with the British Secret Service, the connections he has collected make him a man much in the know of the intrigues in the Middle East. This is especially true due to his close friendship with Sheik Hussan Ali, chief of the Kurds in the northern region of Iraq. This knowledge brings people to him wanting to know more about a lot of things which makes the naturally inquisitive Darroch look even deeper, and that always brings danger. Darroch is married to the beautiful Layla, a French woman who has spent so much time in the Middle East that she is often mistaken for a native. She has a radiance and an allure that makes her captivating to every man who meets her but she invariably laughs such attention off without offending, making her an excellent aid to Darroch as he moves through the chauvanistic world of Iraq. Intrigue is the keyword with this series, both from an international viewpoint as the various businessmen from different lands vie for profits as their governments vie for control, but also from a personal aspect. Who can you trust and why can you trust them become daily questions to Darroch as he tries to live and survive in the lands of pre-Hussein Iraq. The first book is told from the perspective of Darroch while the second is from a newcomer who gets befriended by the Darrochs and then drawn into their activities. This presents a different, enjoyable viewpoint of Mike and Layla. A letter from his estranged father talking of dangers he was facing in Baghdad comes at the same time as a letter announcing his father's death. Michael Darroch heads to Iraq to find out how his father was killed and becomes embroiled in the local turmoil. Ken Cameron accepted the job of tutor to a Sheikh's daughter in Baghdad to get away from a floundering marriage. When he meets up with his old friend, Michael Darroch, he is caught in the thrill of the game of international intrigue. While the main character is not a spy, the intrigue that he gets involved in would certainly satisfy any would-be agent. The two stories are very well written and quite compelling as they present a mixture of old hand versus newcomer. This mixture changes, though, as in the first book it is Darroch who is the newcomer while in the second, he is the old hand. In both cases, Layla remains constant and always in the know. The author largely concentrated on police detective stories centered in Scotland and these two books represent his main excursion from that. They apparently did not do well enough to continue. I am ambivalent about that except I would have liked more Layla. She could have had her own series. 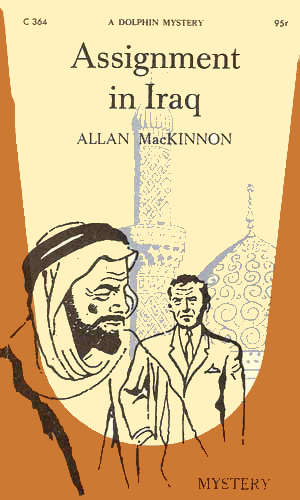 MacKinnon is one of the great British thriller writers of the period too little known on this side of the pond. His Cormorant Isle is one of the best thrillers of its period for my money.